Pat Fitzgerald coaches from the sideline. Fitzgerald this week defended a controversial option play-call on fourth-and-three against Penn State. 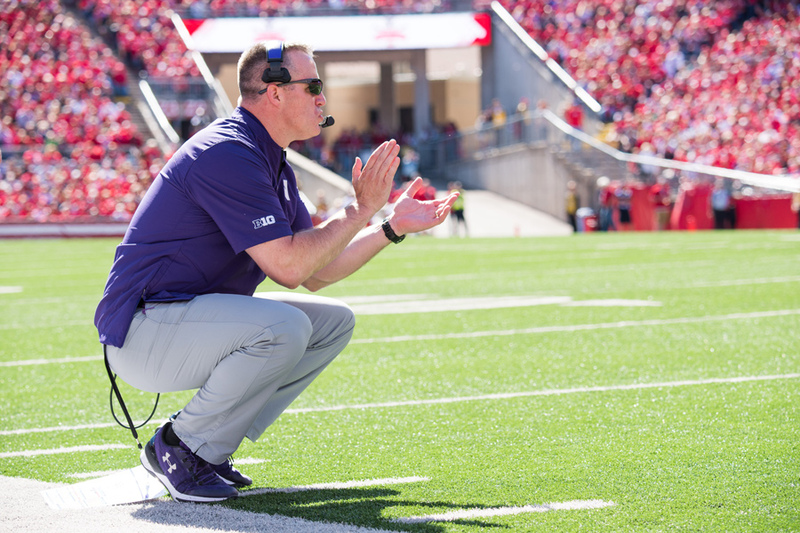 With Northwestern possibly set to play the first half Saturday at Maryland without its top two options at middle linebacker, Wildcats coach Pat Fitzgerald posited the perfect replacement. A two-time All-American middle linebacker in 1995 and 1996, Fitzgerald tallied nearly 300 tackles and helped lead NU to the 1996 Rose Bowl while wearing the 51 jersey. He has not, however, played in a college game since New Year’s Day in 1997. This season’s regular starter, Paddy Fisher, will miss the first half against the Terrapins following his ejection for targeting in the second half a week ago against Penn State. His backup, sophomore Nathan Fox, has missed NU’s last two games with injury but is not listed on the injury report this week. Fisher will return for the second half, but the Cats have no clear option for the first half. Senior Brett Walsh is a natural outside linebacker who shifted inside after Fisher’s ejection, and true freshman Blake Gallagher, who has appeared on the depth chart on the outside, could get his first career start. Walsh and junior safety Jared McGee both said even an untested, out-of-position current player would fare better than Fitzgerald. McGee granted that his coach might help in one area. NU took significant criticism for a failed fourth-down option play against Penn State, but the coach defended the play call and unloaded on his offensive line for the failure this week. Facing fourth-and-three at the Nittany Lions’ 33-yard line, the Cats called a speed option, a play in which junior quarterback Clayton Thorson rolls out and either keeps the ball or pitches it to the running back. Penn State had several unblocked defenders, dooming the play and leaving fans to gripe over the play call, a frequent choice of much-maligned offensive coordinator Mick McCall. But Fitzgerald, who defended the call postgame, reiterated that it was an excellent one. When Fitzgerald’s playing career ended, he transitioned almost immediately to coaching. His first stop was Maryland, where he served as a graduate assistant in 1998. The contest is the first-ever between the Cats and the Terrapins, who joined the Big Ten in 2014.